We sailed from Hvar to Dubrovnik on catamaran Ferry, the fastest and the most comfortable way to get to Dubrovnik. We met our guide at Place Gates for our walking tour, then we learned some of the history and culture by visiting some important city sites: Old Town, Stradun, Orlando’s Column, St. Blaise Church, the 12th century Cathedral (funded by Richard the Lionhearted when he was shipwrecked here after the 3rd Crusade), Rector’s Palace, Sponza Palace, and the Franciscan Monastery. The main promenade in Dubrovnik’s Old Town is the Stradun, with its gleaming white buildings and paving stones (which get treacherous when wet!). With shops, cafes, restaurants along this wide pedestrian mall and along narrow side streets, it is the place to see and be seen. walking through Old Town of this absolutely beautiful city. We also climbed the winding steps and trail to the top of Mt. Srd to visit the old fortress, which had a wonderful photo exhibit about Dubrovnik during the “Homeland Wars” in the 1990s. And the views were fabulous of the city, port, and beautifully blue Adriatic Sea. Of course, our Dubrovnik visit would not have been complete without walking (up & down, up & down) the famed wall surrounding most of the city. 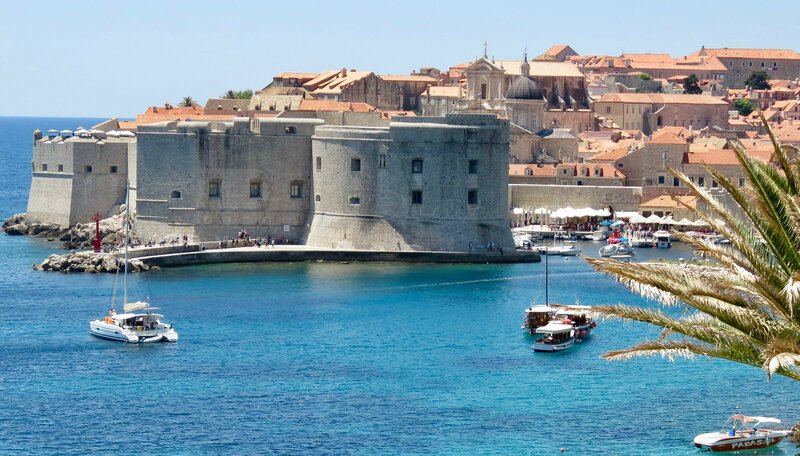 We could see St. Lawrence’s Fort at one end of Old Town Dubrovnik where some scenes of Kings Landing in Game of Thrones’ were filmed. The Fort of St. John is at the other end of the port.